Looking for something that will excite your mechanical engineering students? 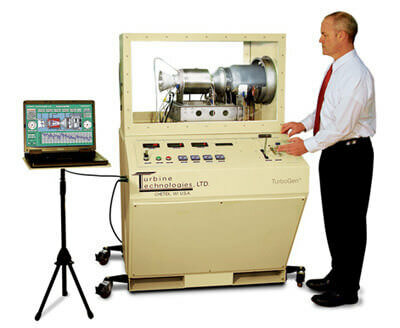 We build lab specific turbine equipment---and so much more! What are you interested in? Do you teach Thermodynamics and/or Power Systems? We have the best systems for getting your students “fired-up” to learn. What could be more dramatic than having your students throttle up a live jet engine system? You will definitely have their undivided attention. Our MiniLabTM Gas Turbine Power System will inspire your engineering students to get into the study of the Brayton Power Cycle. The on-board National InstrumentsTM Data Acquisition System and LabViewTM Generated Custom Virtual Instrument panel allow students to monitor all aspects of the system in real time while being able to analyze the runs in detail later on. It doesn’t end there. MiniLabTM can be used for bio-diesel fuels research. It can team up with our SprayViewTM Fuel Atomization Verification System. Together, they can be used to pre-test fuel formulations to determine if they may actually atomize correctly in the engine. (This can save you on problems and speed up testing). Your colleagues in Chemical Engineering would very likely want to teach their students how to performance test bio-diesel fuel formulations they develop in their lab. (Chem-E students need some excitement in their lives too!). Want to take jet power to another level? How about jet powered electrical generation? Here’s where you could team up with the Electrical Engineers, Aero Engineers, and those Chemical Engineers again to gain some fantastic hands-on educational experience. Our TurboGenTM Gas Turbine Electrical Generation System is that next level. The same MiniLab Power System drives a 2 kW electric generator. Students can cover a number of bases, including the Brayton Cycle, Electric Power Generation, and conversion efficiency. Fuels research takes a giant step forward as the unit allows a direct performance comparison of electrical power production performance on various bio-diesel blends. SprayView is also an excellent accessory for this system. As with the MiniLab, the TurboGen features an on-board National Instruments Data Acquisition System and LabView Generated Custom Virtual Instrument panel which allow students to monitor all aspects of the system in real time while being able to analyze the runs in detail later on. Do you teach Renewable Energy topics? How about Wind? Our newest offering, the WindLabTM Wind Turbine Electrical Generation System, is a scale three-phase wind generation station. Engineering students thinking about a renewable energy career will certainly gravitate to this outstanding system. WindLabTM is equipped with its own programmable wind source. This wind drives an industry standard 3-bladed rotor system which drives a scale three phase generator through a step-up planetary gear box. Students can observe and study the sinusoidal voltage and current wave patterns in real time on the included custom virtual instrument panel. I hear you thinking - this dialogue is starting to head too much into electrical engineering. Right you are! Let’s talk more about what mechanical engineers can sink their teeth into. The unit has a programmable wind tunnel that produces variable wind speeds. Students can learn about mass flow rates of air and calculate the energy available at the wind turbine rotor to do work. The three bladed rotor is connected to a variable pitch hub. Static and dynamic loading can be discussed. The rotor drives a planetary step-up gear box which can be analyzed on how it works. Since all ME students take some EE-based courses, chances are they can use WindLab to further study the basics of three phase electrical generation. They can adjust loading on each electric phase to see what happens to the true voltage and current wave forms. They can also compare these wave forms against the RMS voltage and current readings displayed on the Virtual Instrument panel to learn about the difference. They also get the opportunity to learn about excitation voltage and how that works. (WindLabTM uses an electromagnetic rotor in the generator, not permanent magnets). Students can actually see how excitation voltage is transferred to the rotating core through a slip ring connection. If you’re thinking of buying anything for your lab, this is the unit to get. Who says this is not valuable knowledge for a Mechanical Engineer? Commercial wind turbine manufacturers need ME’s for not only the mechanical aspects of the wind turbine itself, but for all the logistics of manufacturing, transport, erecting, and maintaining these gigantic systems. What is especially neat about WindLabTM is that it’s clean, attractive, not smelly or obnoxiously noisy, and will really offer a number of opportunities for Mechanical Engineering students to learn hands on. Don’t hold back! Inspire your students with a WindLabTM. Furthermore, imagine what prospective students to your school will think when they see it and your students in action. Be ready for an influx of interest! Do you Teach Pumping and Automated Process Logic Control? Do Mechanical Engineers get involved with pumping and process control? Well, of course they do! Aircraft/Automotive fueling systems, Processing Plants, Oil Refineries, Machinery Hydraulics, you name it—they all have processes that require pumping and process control. Mechanical Engineers typically find themselves the defacto industrial engineer in many facilities. Pumping and Process Control knowledge becomes very important. The FluidMechatronixTM offers students the opportunity to learn how pumping works and how to apply it to various pumping process scenarios using signal feedback loops. They’ll observe and study the destructive phenomenon of Cavitation and learn how to minimize this energy and performance thief. With the on-board programmable automation controller and large format touchscreen human machine interface (HMI), engineering students can actually observe and report on performance characteristics of specific pump impeller profiles and how they fare in particular flow process control scenarios. Students can even design and test their own impeller designs to see if they can improve upon the supplied profiles. Our TrueStructuresTM Strain Analysis System gives your students an excellent progression of primary structures that teach the fundamentals of strain in a logical way. I-beam, tube, and airfoil structures are fitted with strategic strain gauges. Students load each structure and record strain values at each strain station. Analysis is then done to determine how much strain each component is subject to for different loading scenarios. It is designed as a building block system; starting with the I-beam in pure bending, then moving to the tube in pure torsion, pure bending, and combination loading; then moving to the airfoil to combine the knowledge of the first two load elements to analyze an airfoil in various loading scenarios. The system may look simplistic, but rest assured, it will provide an exciting and challenging environment for learning a fairly complex topic in the aforementioned building block fashion.